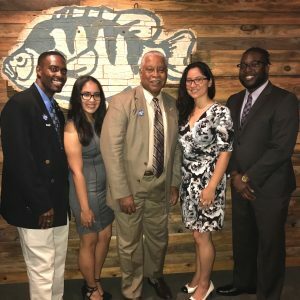 Joseph Isaac, a Ph.D. student at the University of Florida Department of Computer & Information Science & Engineering, has been inducted into Alpha Epsilon Lambda (AEL), a national honor society of graduate and professional students. Isaac is studying human-centered computing under the advisement of Christina Gardner-McCune. He has a bachelor’s degree in computer science from the University of Maryland, College Park and a master’s degree in information technology from the University of Maryland, University College. AEL was founded in 1990 by John Capece, Carole Glover and Suresh Ramamurthi. One of the first chapters was started at UF, but participation dwindled several years ago. Jerone Dunbar, a Ph.D. student in the Human Experience Research Lab focusing on human-centered computing, revived the UF chapter of AEL in 2014 and led the group as president for two years. Dunbar said to be inducted as a member of AEL, one must be a top graduate student in academic excellence (usually a GPA minimum of 3.75), publications and grants, as well as demonstrated leadership across a variety of organizations. According to the chapter’s constitution, only 1 percent of the graduate student body can be accepted. From that 1 percent, the group selects the top 35 percent for membership.